What type of touchscreen laptop is best for you? Windows 8 gave laptop manufacturers the chance to be creative, opening the old keyboard-and-touchpad design to new touchscreen models that were previously niche or didn’t exist at all. A wide variety of mobile touchscreen PCs, some with wildly different features, are now available. These types of systems will only become more common now that Intel officially made touchscreens mandatory in 4th-gen Ultrabooks. The many options on the market can leave consumers confused. What kind of touchscreen laptop is best? What are the advantages and disadvantages of different designs? And is a touchscreen alone worth the premium? To answer these questions, we’ve rounded up the most common types of laptops and carefully detailed each. Convertible laptops have existed for years. They work by folding the screen over the keyboard using a hinge that swings or flips. 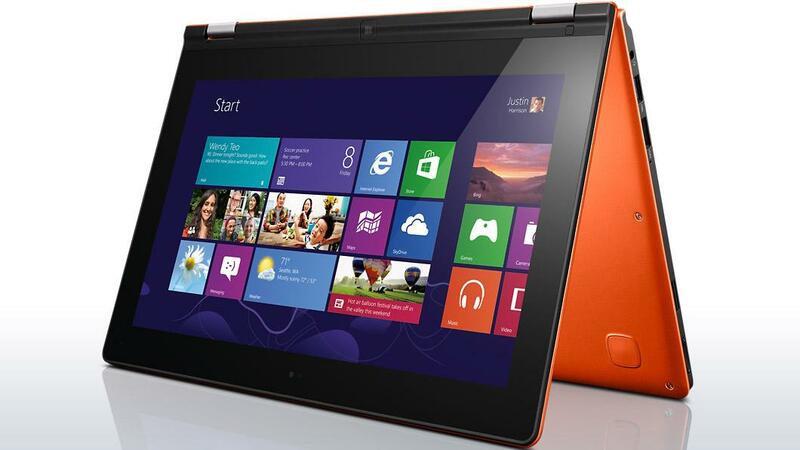 Examples of this design include the Lenovo ThinkPad Twist and the Dell XPS 12. Some models, like the Lenovo Yoga (pictured above) and Acer Aspire R7, have a unique hinge, offering one or more usage modes that can serve as a stand while the system is used on a table or other level surface. Laptops that use this design are usually indistinguishable from a normal laptop when used in their regular mode. They are similar in weight to a normal laptop and often have chassis components similar to other, non-convertible cousins. Most have a display size between 11.6 inches and 13.3 inches and are easy to use as an everyday PC. Bulk is the downside of most convertibles. The keyboard can’t be removed, and the hardware is usually the same as that found in an Ultrabook, so these systems often weigh between two and four pounds. While that may not sound like a lot, it’s enough to make holding a convertible in tablet-mode for long periods of time uncomfortable. Convertibles are best for consumers who expect to spend more time using their system as a laptop than as a tablet. A dockable is a laptop with a screen that detaches entirely. The screen contains the components critical to the laptop’s operation, so the keyboard is just a peripheral that connects via a docking mechanism. 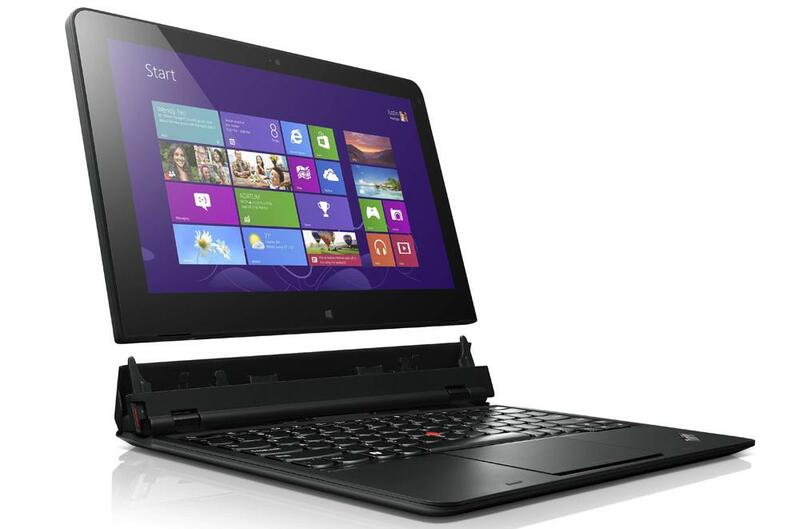 Examples of this include the Asus Vivo Tab, HP Envy x2, and Lenovo ThinkPad Helix (pictured above). Dockables can be unwieldy in laptop mode because the core system components are all in the display, which makes them top-heavy. These systems also tend to have a display no larger than 12.1 inches (though there are exceptions), which in turn means a small keyboard and less powerful hardware. Intel’s new 4th-gen Core processors can make a dockable reasonably quick, but speedy hardware can be expensive. Most users who need serious performance will find a convertible or laptop a better choice. As a tablet, however, dockables are superior to other touchscreen devices with Windows. Removing the keyboard also removes its weight, leaving the tablet between one to two pounds. That’s similar to the 10-inch iPad or a Google Nexus 10. Better still, many designs place an extended battery in the keyboard that can be used to charge the tablet or provide extraordinary laptop endurance. Sliders aren’t just found at White Castle any more. They’re also a type of touchscreen laptop with a display that slides over the keyboard. The idea is similar to a convertible, but the hinge mechanism is more restrictive because it only slides forward and back. Examples include the Toshiba Satellite U920t, and the Sony Vaio Duo 11 (pictured above). Laptops that use this design tend to be light and small with a display size between 10.1 inches and 12.5 inches. They are similar in weight to dockables, but don’t suffer from their top-heavy nature. Unfortunately, most pay for this by offering reduced keyboard space and little to no palmrest. Some also do not offer a touchpad, which can be a problem for some users. But perhaps the most serious flaw is the lack of an adjustable display hinge. Sliders generally lock the display into a single, nonadjustable angle. Tablet use is generally pleasant thanks to a small chassis and light weight. We’ve yet to test a slider we like and don’t currently recommend them. We hope this category will be substanially improved or allowed to die out. Consumers don’t have to buy a crazy new design to grab a touchscreen. They’re easy enough to place in a standard laptop and Intel has forced the issue by making touch standard in the 4th-gen Ultrabook specification. The market is moving rapidly to make touch the rule rather than the exception. 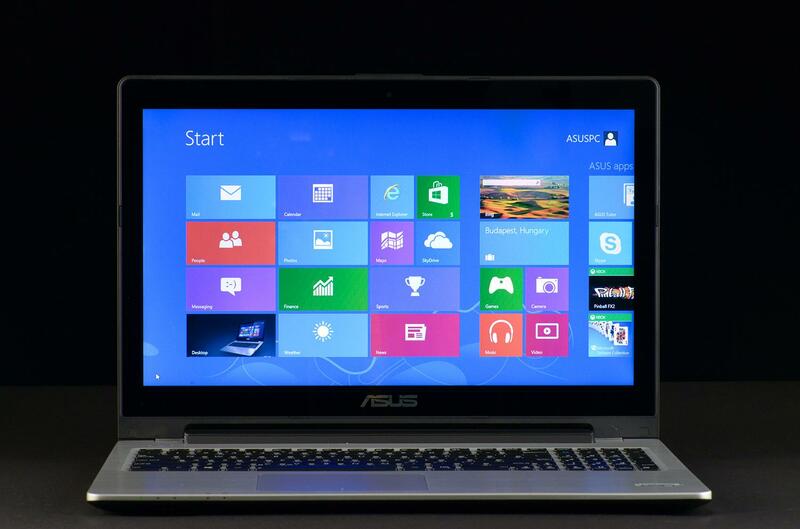 Laptops without the ability to be used as a tablet, like the Asus VivoBook S550 (pictured above), will always be used as a laptop. The touchscreen functionality can be thought of as a giant touchpad. Leaning forward to use it (because it’s father away than the touchpad or keyboard) isn’t ideal, but it can be useful for quick changes to settings or starting/stopping media playback. Touchscreen laptops were sold at a substantial premium when first offered in late 2012, but prices have quickly come down. Touchscreens can now be found on laptops sold for as little as $430 and, as mentioned, touch will be standard on all Ultrabooks based on 4th-gen Intel Core processors. While touch isn’t a killer feature, and some users may see little need for it, the rapid reduction of its price has demolished the main reason to avoid it. If you want touch, go for it. Now that you know about the different types of touchscreen laptops running Windows 8, we’re sure you’re still wondering which one is best. We do have some recommendations. Convertible laptops are great for consumers who want a single do-it-all device. Their bulk in tablet mode is unfortunate, but only a significant problem while traveling. At home, the device can be propped up by a laptop desk, a pillow, or a reading stand. Convertibles also make great day-to-day laptops. If you believe that you’ll use your PC as a tablet more often than a laptop, a dockable is the way to go. They are the lightest and least unwieldy Windows tablets; the best are nearly as good as an Android/iOS device. The trade-off is reduced comfort during laptop use. Though still functional, these systems offer small keyboards and don’t offer the best price for performance value. Sliders are not recommended. Their small size and tendency to eliminate the palmrest and touchpad makes them less than ideal in laptop mode, yet they’re not as light as a dockable when in tablet mode. It’s a trade-off that doesn’t work out well for anyone. Traditional laptops with a touchscreen, though not our top recommendation, also don’t need to be avoided. We don’t find touch to be tremendously useful without a convertible hinge, but the feature’s price is now almost trivial, and touch will almost certainly be standard on all laptops within one or two years. Like it or not, touch is now a part of computing’s future.